This is the recipe that I suggested for my Niece who won Young Chef Competition held in Chennai this 17th (17-5-2013). 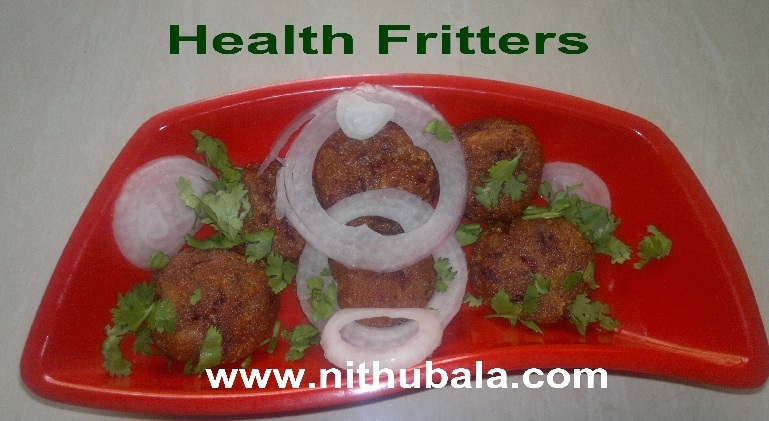 I used Hudson Canola Oil while I prepared these fritters at home. Hudson Canola is very healthy and I love it. This oil is the best choice for health conscious people. But in contest, she used Gold Winner Oil as it was sponsored by them. If you are an health conscious person, you can very well cook fritters on a dosa pan with just a few drops of oil else you can bake it in oven. Either way, it tastes good. 1. Dip bread in water. Squeeze well. 2. Now, combine all the ingredients. Make a soft dough. 3. Divide the dough in to equal portions. Make balls and keep aside. 4. Heat oil. Now, gently flatten the prepared balls and fry on a medium heat until cooked properly. 5. Drain extra oil by placing in a clean kitchen towel. 6. Garnish and serve hot with a ketch up. Congratulations to your niece on winning the Young Chef comp. Nice crispy snack. SathuMaavu addition is new to me! No wonder your niece won an award for this recipe!! yum yum yummy!!! very crispy and very delicious!!! Thanks for using Hudson's Canola oil in your healthy and yummy looking fritters! Congratulations on your niece's win in the Young Chef Competition! We're so glad to know that your fritters using Canola oil saw your niece to first place! Hudson has in fact just launched a food blog: www.hudsoncanola.com/blog. To find more healthy and delicious recipes using Canola oil, do visit our blog! Moreover, we would like to feature your fritter recipe on our site as well! If you find that Hudson's blog is something you like, then feel free to post a link to it on your own blog as well!